Methamphetamine (Meth) is a stimulate. Meth has a high potential of abuse and addiction due to the increase of dopamine, norepinephrine and serotonin in the brain. Meth is responsible for approximately 9% of all admissions to treatment facilities (TEDS Data – 2007). Regular meth is a pill or powder. Crystal meth resembles glass fragments or shiny blue-white “rocks” of various sizes. Another name for Meth is Crank. Crank comes in various colors. Usually snorted, swallowed, injected, or smoked in a glass pipe. 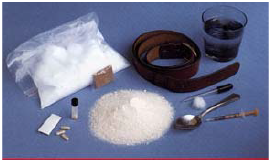 As tolerance builds toward the drug, the users must intake more or change the methods of intake and frequency. Meth is a highly addictive drug with potent central nervous system stimulant properties. The user will experience a rush or intense sensation when the drug is used. ​The rush is a result from the release of high levels of the neurotransmitter dopamine into sections of the brain the regulate feelings of pleasure. Researchers have reported that as much as 50% of the dopamine-producing cells in the brain can be damaged after prolonged exposure to relatively low levels of meth. Serotonin-containing nerve cell may be damaged even more extensively with prolonged use. 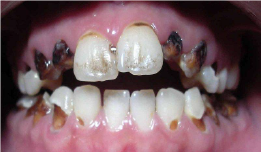 This is a case of “meth mouth”. High doses can elevate body temperature to dangerous, sometimes lethal, levels as well as cause convulsions and even cardiovascular collapse and death. Long-term methamphetamine abuse can also lead to addiction—a chronic, relapsing disease, characterized by compulsive drug seeking and use, and accompanied by chemical and molecular changes in the brain. Some of these changes persist long after methamphetamine abuse is stopped, and some reverse after sustained periods of abstinence (e.g., 2 years).